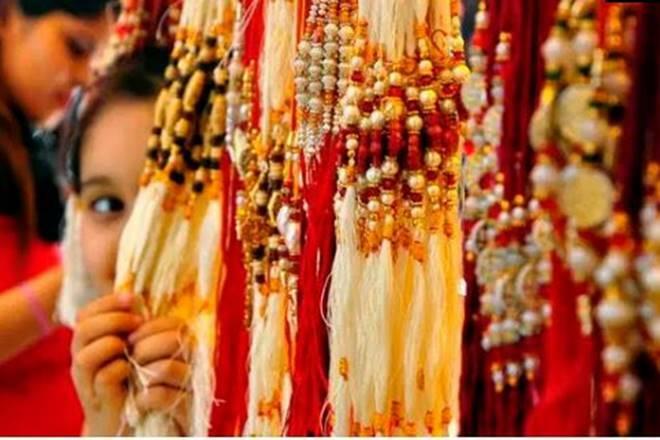 MULTAN/JACOBABAD: Scores of Hindu families Sunday celebrated their ‘Raksha Bandhan’ festival, which symbolizes the bond of love, protection, trust and compassion among siblings in a family. In the Raksha Bandhan ritual, a sister ties a ‘sacred’ thread around her brother’s wrist, symbolically expressing her love for him and seeking his protection in return, according to Hindu community leader Shakuntala Devi. Talking to APP here Sunday, she said that a sister also puts a ‘Tilk’ on the forehead of her brother and it is called ‘Ashirwad’ (blessing-prayer). She said that hundreds of Hindu families lived in Multan city in various localities and some other cities of the region. The origin of the festival is unknown, though mythology is replete with stories that talk about the celebration. One such story relates the bond of trust between King Bali and goddess Lakshmi. After being defeated thrice, King Bali in what was a boon to Vishnu, confined himself to his house. Lakshmi, in order to get her husband back, tied a thread around King Bali’s wrist and in return, asked him for a token to mark the bond of compassion and faith. King Bali couldn’t refuse and had to send Lord Vishnu to her. Another story goes like this: one morning, when Lord Krishna was flying a kite, he cut his finger with the kite string. Draupadi, on seeing blood coming out of his finger, ran to him, tore a piece of cloth from her “sari” and tied it on his bleeding finger. Lord Krishna was so touched by this act that he promised to protect her from all evils, forever, in return. Hindu community leader Shakuntala Devi tied the thread on the wrist of Raggu Veer and Manive. Hindu women wear new dresses and make-up to mark the festival. They also take part in a funtion called ‘Arti Utarna’, which is a good wish for brothers. Some sisters travel to other cities to tie the thread to their brothers. On this occasion, sweets are distributed to share happiness and joys of the festival. In Jacobabad, women celebrating the festival said prayers for their brothers’ long life and tied a rakhi around their wrists. “Our brothers promise to protect us on this festival every year,” a resident of Jacobabad, Sanjana Khurana, told Geo News, as she sat with her brother Sandeep Khurana. As soon as the date for the festival approaches, shops are flooded with rachis of various colours. Historically, the festival has not been limited to Hindus only. It is believed that Rabindranath Tagore, a writer and poet of his times, promoted the concept of Rakhi among Hindus and Muslims in the subcontinent during the British Raj. He is said to have done so in order to unite the Hindus and Muslims against the British colonial rulers.